Today, we really are spoilt for choice when it comes to just about everything including the availability of different types of accommodation. When planning a week-end get away or business travel in the United Kingdom, do you really have that much time to browse through travel and accommodation directories? Knowing exactly what you are looking for will cut out a lot of the hassle and having the option of making a booking while ‘on the go’ will save even more time and hassle. The first type, which are often a popular choice for those on business travel, are the Chain Hotels such as the Hilton, Marriott and Holiday Inn. This type of accommodation can be found in most of the UK’s major cities. These hotels are targeted at the needs of business travellers by the fact that the guest-rooms are equipped with spacious desks and Internet connection. The advantage of this type of accommodation is that they are often located near airports and, or major Railway Stations for easy access. They are also equipped with facilities such as a fitness centre, dinning area, conference rooms, and lounge area in which to relax. The disadvantage is that they are generally a more expense choice of stay and are impersonal due to the volume of guests who come and go everyday. Citizens of the UK consider Bed and Breakfasts to be a traditional type of accommodation. Typically, bed and breakfasts are private homes with fewer than 10 bedrooms available for commercial use. Rooms are offered to guests usually for week-end or mid-week stays as well as breakfast in a common dining area. The advantage of this type a accommodation is that the host will invariably want to make sure that you are comfortable and feeling at home, they are generally less expensive than a hotel stay and they offer a more personal touch. Bed and Breakfasts are, however, not all suited to those on business travel because guest rooms aren’t equipped with a desk and Internet connection. Holiday Resorts cater primarily to leisure travelers and are generally found close to the beach, near established ski slopes and in or near theme park attractions. This type of stay usually has facilities for recreational activities such as a swimming pool, tennis courts, golf course and one or two dinning facilities. Prices vary depending on the location and are ideal for family holidays. Lastly, there is the choice of a serviced apartment, which are ideal for leisure travel, business travel as well as for those looking for temporary accommodation while relocating to a different town or county. Serviced apartments are fully furnished with a fully equipped kitchen. The advantage of staying in a serviced apartment is that you pay per apartment and not per person, so if there is more than one of you, it is less expensive than a hotel stay of equal standards. You also have all the typical comforts of home and flexibility to prepare your own meals and invite friends to savour your cooking. Quick access to making a reservation is sighted by many as a key criteria when choosing a preferred type of accommodation for business or leisure travel. 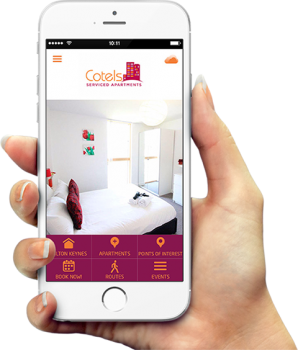 If you are one of those people who run a tight daily schedule then you may well like the fact that Cotels have launched the availability of an app you can download from the App Store which will allow you to make a booking while ‘on-the-go’. The Cotels serviced apartment app will also give you directions on where to collect your apartment keys, park your car and make your way up to your apartment. Just another service Cotels offer guests to take the stress out of finding and booking accommodation. So if you are looking for accommodation in Milton Keynes, be sure to download the app! Cotels – Serviced Apartments is a great place to stay. These serviced apartments Milton Keynes are situated in the City Centre close enough to all the many activities and entertainment facilities of this vibrant City.